One of the new technologies VMware released with vSphere is a security tool called vShield Zones. Learn how it works in the first part of this three-part series. Zones. While VMsafe's application programming interfaces are designed to help third-party vendors create virtualization security products that better secure VMware ESX, vShield Zones is a security tool targets the VMware administrator. VShield Zones is essentially a virtual firewall designed to protect VMs and analyze virtual network traffic. This three-part series describes vShield Zones, explains how to install it and provides useful management tips. To begin, let's get started with the basics: what vShield Zones is and how it works. VShield Zones is essentially a virtual firewall designed to protect virtual machines and analyze virtual network traffic built on VMware's Blue Lane Technologies acquisition in 2008. 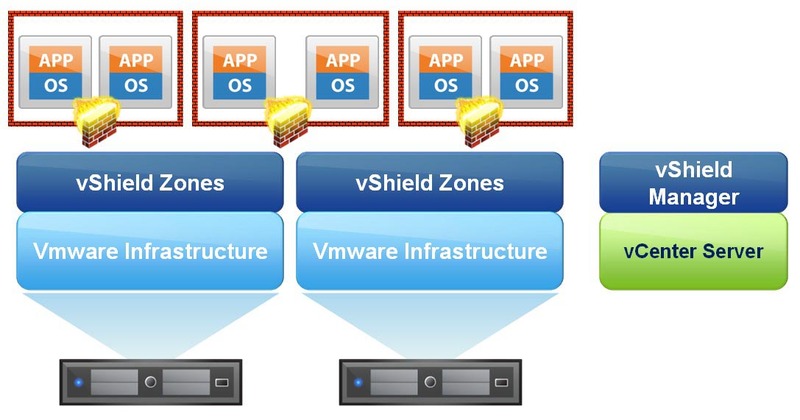 The current 1.0 version of vShield Zones is not yet integrated with VMware's new VMsafe technology but VMware plans on using the VMsafe APIs in vSphere in a future release of vShield Zones. VShield Zones is available as a free download with the Advanced, Enterprise and Enterprise Plus editions of ESX and ESXi. Firewall protection – VShield Zones provides firewall protection across vSwitches using rules that allow and block specific ports, protocols and traffic direction. The firewall function is termed "VM Wall" and provides a centralized, hierarchical access control list at the data center and cluster level. Layer 4 and Layer 2/3 rules are configurable; these are the data link, network and transport layers of the OSI networking protocol model. Traffic analysis – All traffic that passes through vShield appliances is inspected. Information on source, destination, direction and service is gathered and aggregated into the vShield Manager. The traffic analysis data is termed "VM Flow" and can be used for network troubleshooting, investigating suspicious traffic, and to create access rules. Virtual Machine Discovery – The vShield agents utilize a discovery process when analyzing traffic which notes the operating system, application and ports in use. Once this information is collected and analyzed it can be used for firewall rule configuration. VShield Zones consists of two components, the vShield Manager and vShield agents, both of which are deployed as virtual appliances from the included Open Virtualization Format (OVF) files. VShield Manager is the centralized management device that is used to manage the vShield agents. It configures rules and monitors network traffic. A single vShield Manager can manage vShield agents on multiple ESX/ESXi hosts and is accessed using a Web-based interface. Once you select a vSwitch to protect with vShield Zones, the vShield Manager will deploy the vShield agent on to the host that the vSwitch is located on. The vShield agent is what provides the firewall protection, performs the network traffic analysis and utilizes trust zones which separate traffic into protected and unprotected zones. Network traffic enters from the unprotected zone and goes through the vShield agent to get to the protected zone where the virtual machines reside. Think of a group of houses that are accessible via an open road that anyone can access. To protect those houses so only authorized visitors can get to them, the houses are moved to an isolated island. To get the island, you have to cross a single bridge. At the bridge entrance is a guard (vShield agent) that only allows visitors on the guest list (firewall rules) to cross the bridge. Additionally he inspects and logs all traffic that passes across the bridge to look for anything suspicious (traffic analysis). In more technical terms, here's what happens when you deploy a vShield agent. A new VM is created for the vShield agent from the template. This virtual machine (VM) has three virtual network interface cards (vNICs) assigned to it, one for its management interface to talk to the vShield Manager, one to connect to the original vSwitch (vSwitch1) for unprotected traffic (entrance) and the other to connect to the new vSwitch (vSwitch2) that is created for protected traffic (exit) to reach the VMs. A new vSwitch (vSwitch2) is created that has no physical NICs assigned to it. A new port group is created on vSwitch1 for unprotected traffic and a new port group is created on vSwitch2 for protected traffic. The vShield agent's vNICs are connected to both these port groups. All VM port groups from vSwitch1 are created on vSwitch2, the settings for each VM are edited and the NICs are moved to the new port groups on vSwitch2. 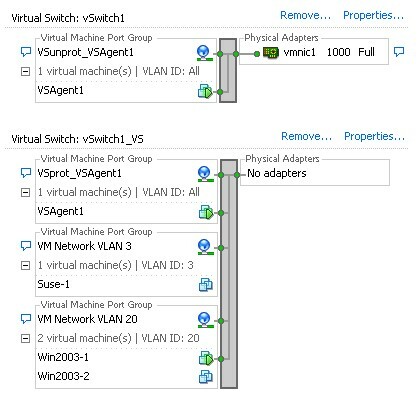 Once the VMs are all moved to vSwitch2 the original port groups are removed from vSwitch1. As you can see all traffic must go through the physical NIC on vSwitch1, then through the vShield agent VM, then to the new protected vSwitch1_VS vSwitch where the VMs are located. There is, however, an additional requirement that is currently not documented. The vShield Manager VM is created with 2 GB of memory and also has a preset memory reservation of 2 GB. The vShield agents are created with 1 GB or memory and have 1 GB preset memory reservations. Because of these reservations you must ensure you have enough available free physical host memory to satisfy the reservations when the Manager and agents are powered on. While it is possible to edit the VM settings and remove the reservations, it is not recommended, because this can affect the performance of the appliances which can affect their functionality. Do not increase the amount of memory assigned to the vShield Manager and agents as this will not increase their performance. Port 1162 – Simple Network Management Protocol, or SNMP (UDP) – Used to send SNMP trap messages from vShield agents to the vShield Manager. All other statistics, including memory and CPU, use port 22. The vShield Manager can manage up to 50 vShield agents and a single vShield Zones agent can protect up to 500 virtual machines. In the next part of this tip series, we will cover how to install and configure the vShield Zones Manager and agent components.